Share your time and valuable experience with our community ... Meet people for shared experiences of the arts ... Become part of the MACC ‘ohana! Volunteers are essential to the operation of Maui Arts & Cultural Center. Not only does their work contribute to patron safety and enjoyment of the performances but also enhances the bottom-line of our nonprofit organization, allowing us to offer affordable ticket pricing and free events for the community. Hundreds of volunteers help the MACC in a variety of areas, including: Arts Education, Exhibits, Development, Marketing, Administration, Operations and Special Events. For volunteers who enjoy working with children. The Center’s CanDo! Days school field trip is an arts immersion program for 1st to 5th grade students. Volunteers assist in the classrooms and guide students from one session to the next. For volunteers who enjoy fine arts and meeting the public. Duties include greeting guests and tracking attendance in Schaefer International Gallery. A volunteer walk- through is held at the opening of each exhibit to acquaint you with the exhibit. For volunteers who enjoy clerical work and attention to detail. Periodic group mailings to members are a significant part of the Development Dept. Our mailing team works together sorting, folding, stuffing and sealing envelopes. For volunteers who enjoy clerical work and attention to detail. From time to time, help is needed with various office tasks such as data entry, collating printed material and counting. Computer skills are a plus. For volunteers who enjoy answering phones and helping patrons. Volunteers are needed for office reception duties. MACC’s administrative office is open Monday - Friday, between 9am and 5pm. Shifts are divided between morning and afternoon. 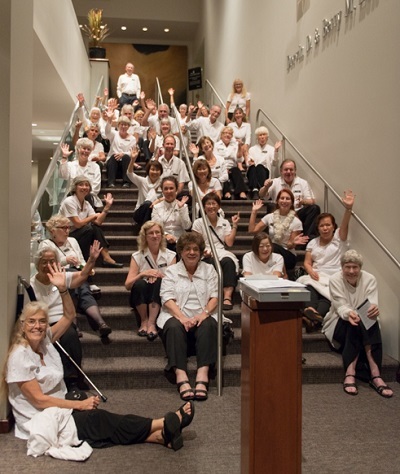 For MACC performances, volunteer ushers play a very large role in the patron experience. The major responsibility of our ushers is the safety and enjoyment of the patrons. With this in mind, ushers must possess a friendly personality, enjoy meeting people, able to climb stairs and hold doors open, move quickly if needed and have good vision in limited lighting. A three-hour orientation session is required to become an usher. Dozens of volunteers are needed to work at outdoor concerts and special events. Duties include: scrip selling, ticket taking, aisle monitors, audience and scrip counters, and silent auction attendants, to name a few. To show our appreciation for our many loyal volunteers, MACC management and staff produce an annual event in their honor, giving volunteers the opportunity to be a guest for an evening filled with food, fun and music. At this party, volunteers are recognized for various achievements and milestones and awarded prizes. Mahalo for your interest in volunteering!